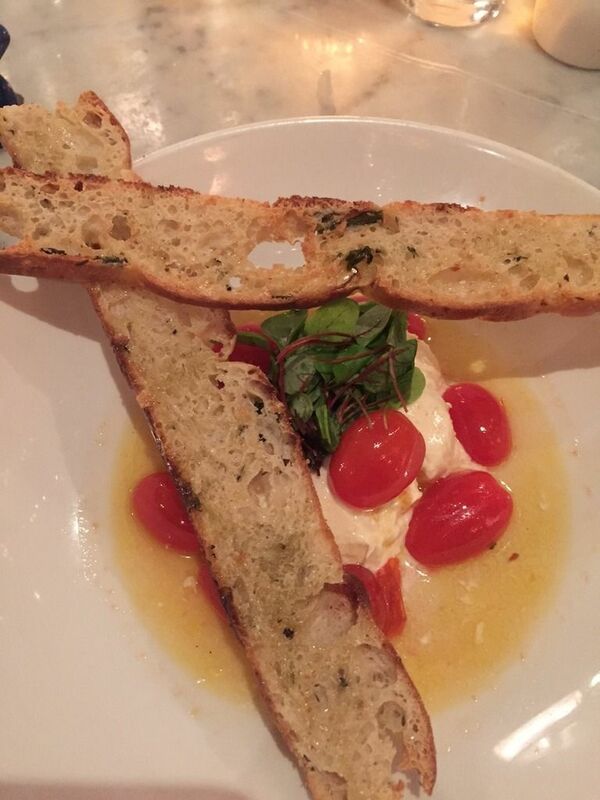 The burrata caprese at Fiorello is almost too beautiful to eat. Where do I go to eat when I’m just eating? Mostly in my neighborhood, of course. To Red Farm at least once a week for dim sum and shrimp-stuffed chicken. To Lincoln Ristorante when someone is taking me for lunch or when I’m wooing possible Citymeals-on-Wheels donors. 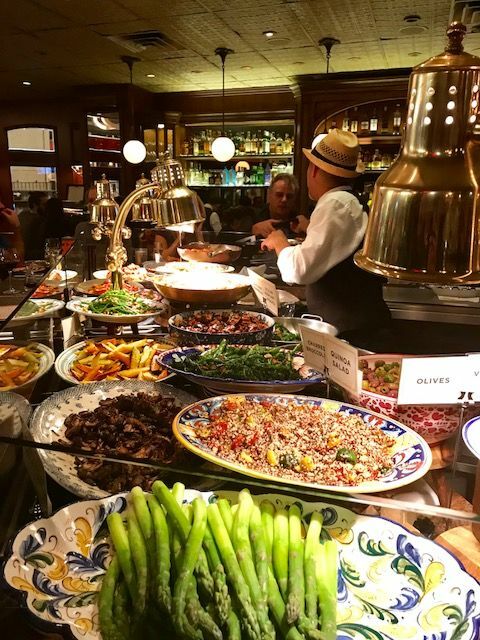 Once a month to Boulud Sud because it’s so civilized and I’m craving the Mediterranean mezze and the Moroccan Harira soup. 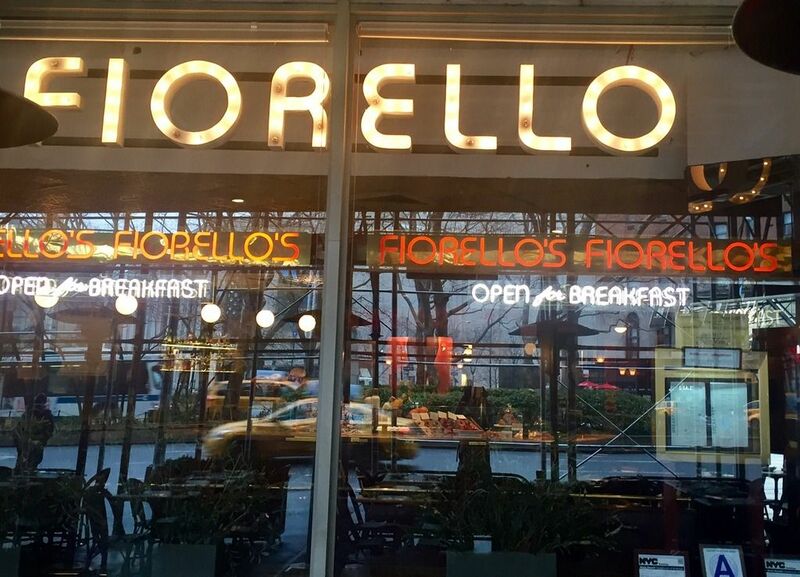 Fiorello opens at 7:30 for breakfast at the counter Monday to Friday. I like to step up to the antipasto display myself and make my choices. 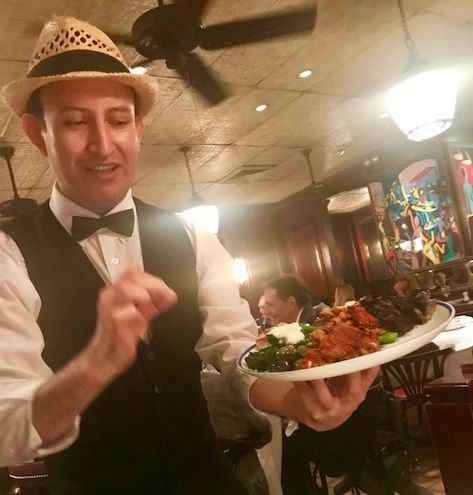 The waiter then delivers the plate. But lately I’m at Café Fiorello more often than anywhere else. Though I tweet about my dinners there, usually with photos, I haven’t recently focused on how good it is, how essential to my life. Did I ever mention that all my pants have elastic waistbands? 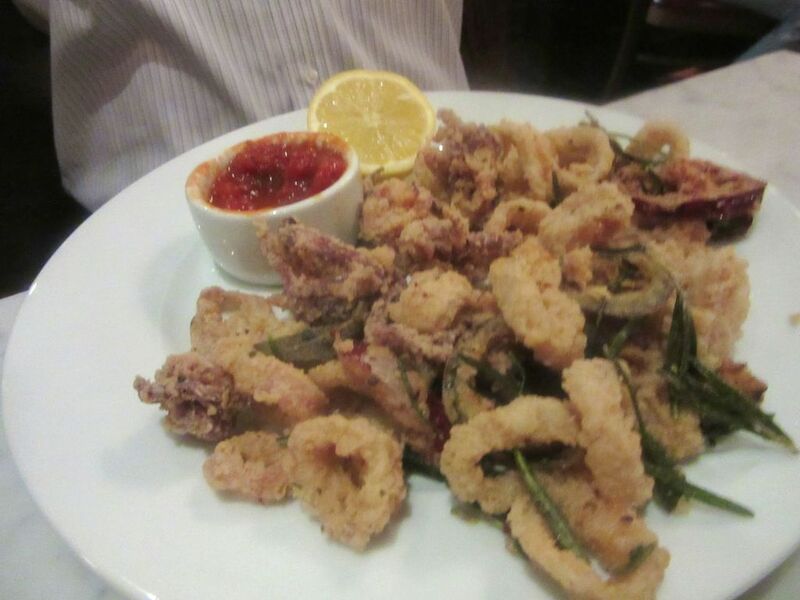 Sometimes dinner will be a series of small plates including fried calamari. The Caesar has evolved over the years. 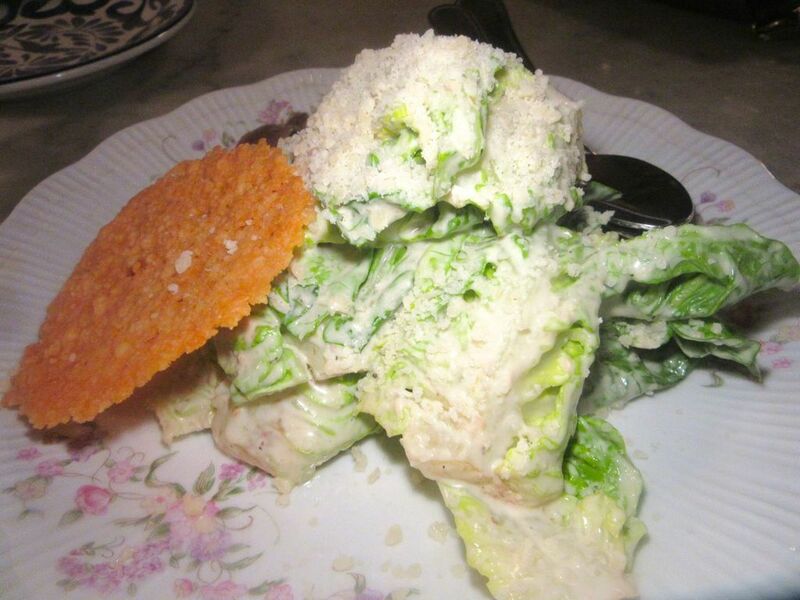 Now it's super crisp Little Gem lettuce with a Parmesan frico. I used to love sitting in the last botth where I could see my guy's large photograph of a Tuscan delicatessen. We sat in the back booth near the kitchen and one day a brass marker with our names joined other tenants of that booth. Long after Steven died, I enjoyed my claim to that post because it let me see two of his large Tuscan photographs on the wall and another on my way to the bathroom. As a critic I tried not to know restaurant owners, but then I met Shelly and Marilyn Fireman in a Tuscan bar. Dana asked for the vegetable pizza without mushrooms and the kitchen tripled the asparagus. My relationship to Fiorello, it’s clear, is dangerously complex. 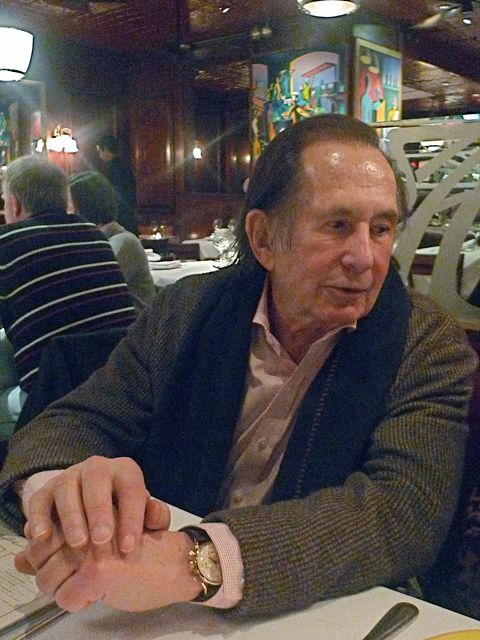 I was there when Shelly Fireman opened Café Fiorello across from Lincoln Center. In 1985 I decided it served the “Best Pizza in New York.” Click here to read The Joy of Pizza. 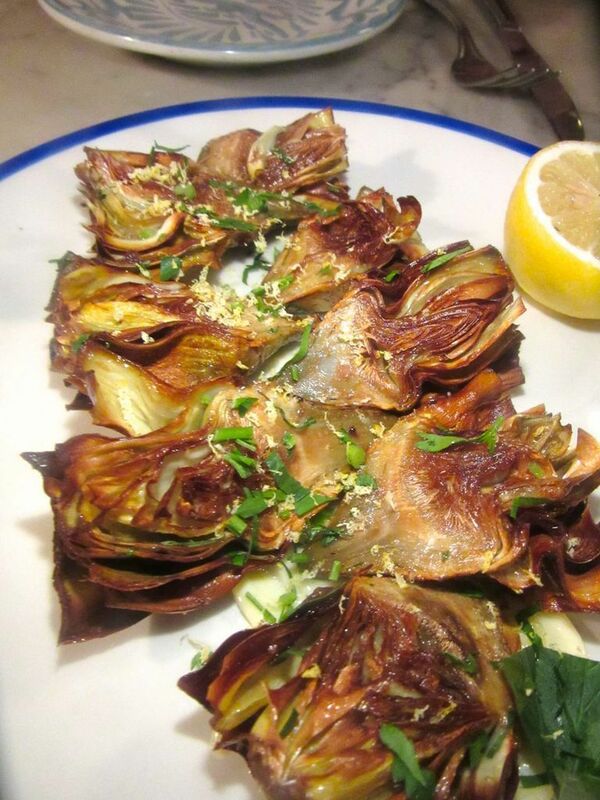 The fried artichokes alla guidea are a specialty here. They are almost always fresh and wonderful. I didn’t know Shelly Fireman then. I didn’t know he laid the linoleum himself at his feeding debut, The Hip Bagel. 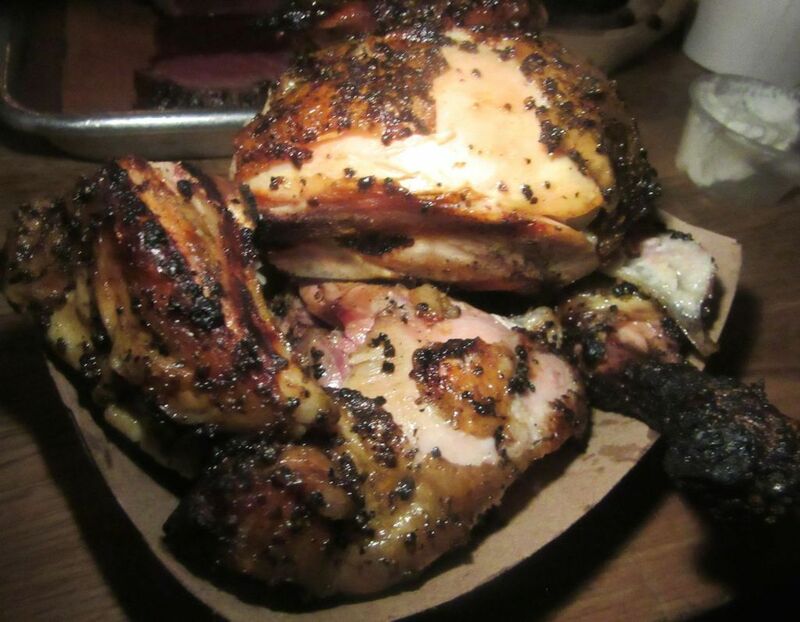 As a restaurant critic, I tried to isolate my eating from thoughts of restaurant owners. But one day while vacationing in Pietrasanta, Italy, someone introduced me to Shelly and Marilyn Fireman in the Michelangelo bar, and we became friends, exploring gastronomic detours around Tuscany, and later, sharing reviewing dinners in New York. One day a wall came down and a back room with its Kostabi painting became visible to the main dining room. 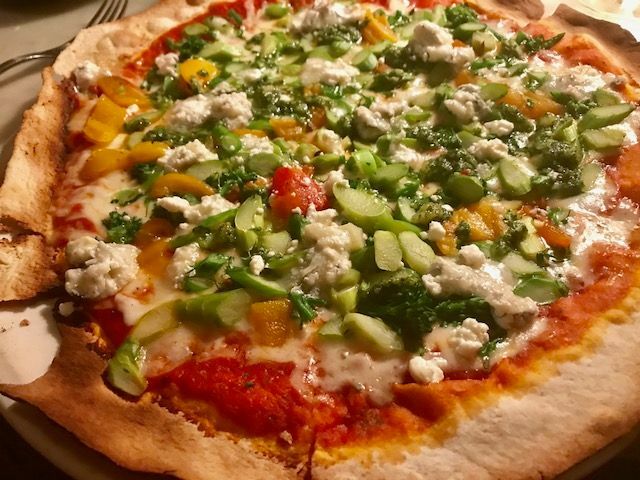 Fiorello’s pizza has evolved over the years. It was cracker-thin and square. Now it’s round. The menu is constantly changing. A wall cut opened up a separate dining area and a new bar arrived in March last year. The counter around the antipasto display has grown. They started serving over-the-top breakfast items. Steven’s big photos have been replaced with stylized paintings by Mark Kostabi. 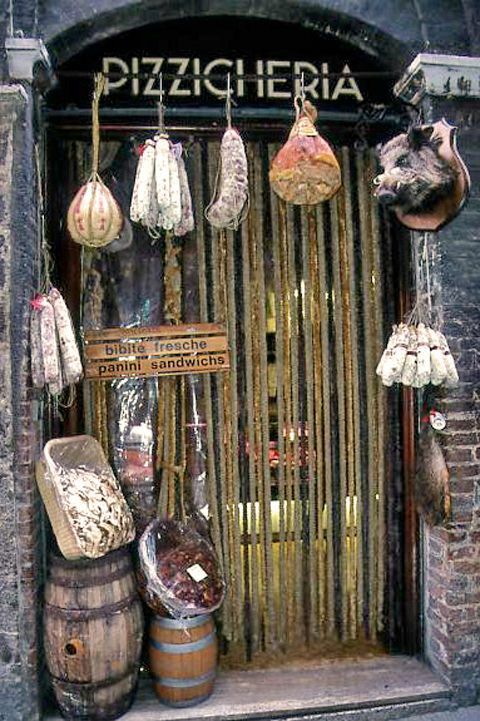 I like to take a quick look at the antipasto counter on my way to check in with the maître d'. 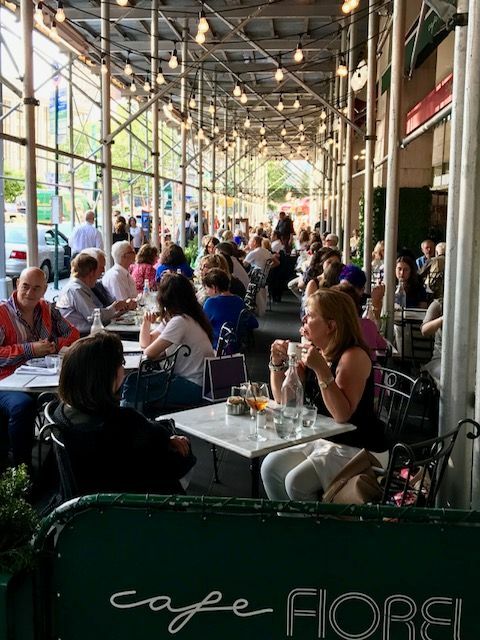 The patio has been packed all summer even on nights when the heat and humidity are fierce. By 7:30 most of the early birds are gathering themselves together to cross Broadway to Lincoln Center. I’ve discovered that it’s quieter to avoid the kitchen traffic by claiming a booth across the room. Almost all of the waiters are friendly. Some come before you call. Others are always racing the other way. On a summer Saturday with a full patio, the house serves 1500, and 800 to 1000 covers daily the rest of the week. 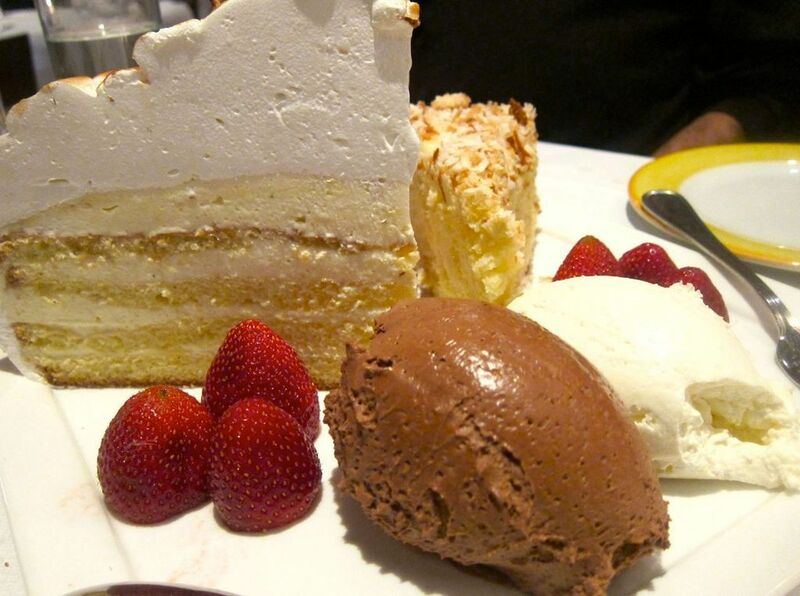 Sometimes you say "no dessert tonight" but the manager insists anyway. 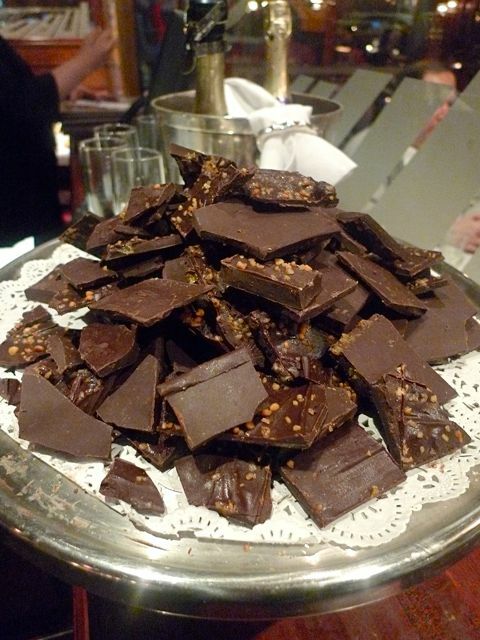 Chocolate fans might want to try Fiorello's tartuffo. Give the server advance notice so it thaws a little. I’m still in a Caesar salad mode. I share one every time, no matter whom I’m dining with. The classic has changed a few times over the years. It was chopped briefly. I think it had dried cranberries for a while. I begged the waiter to tell someone to stop with the cranberries. Now it’s the Little Gem Caesar with Parmesan frico. All winter dinner was Italian wedding soup with a carafe of red wine. It was an addiction. 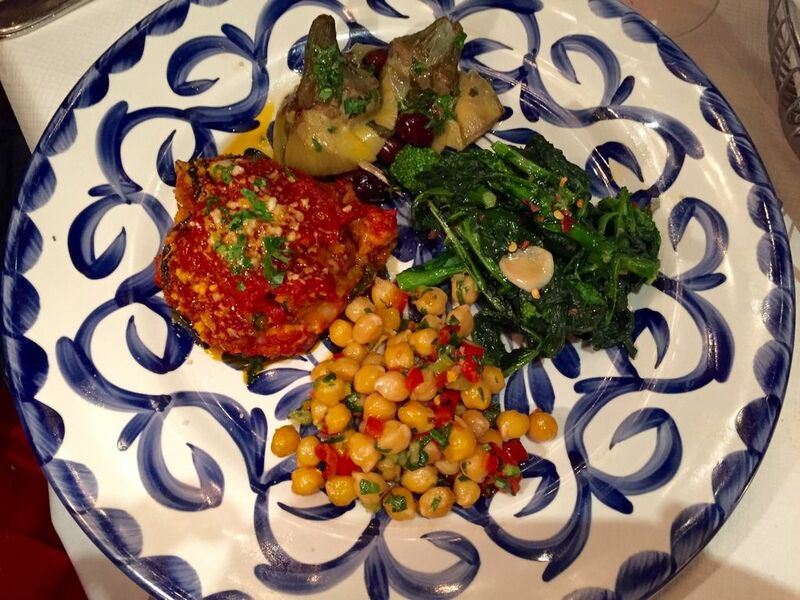 I selected this antipasto plate for a nephew visiting from Maryland, his first dinner at Fiorello. 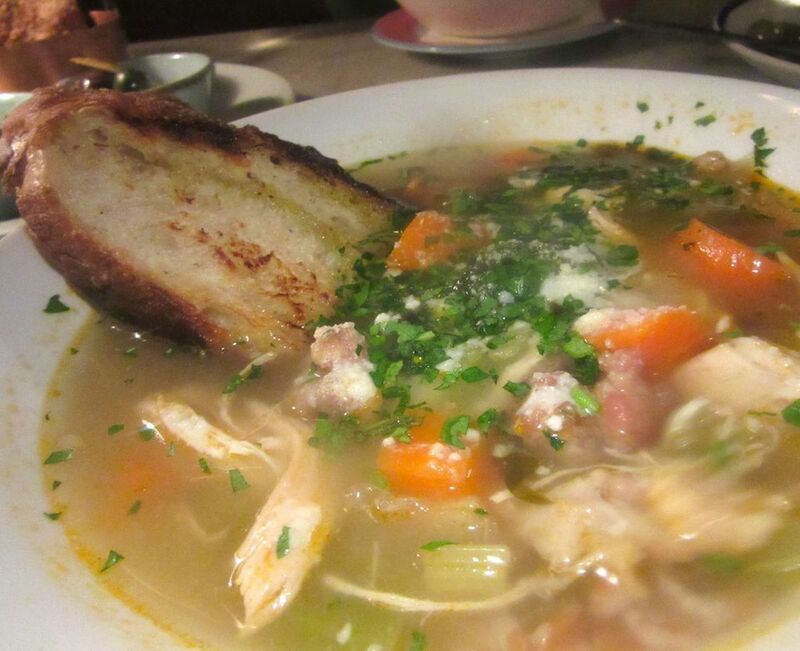 All winter my niece Dana and I each ordered a big bowl of Italian wedding soup, an intense broth with large pieces of chicken, meatballs, noodles, carrot chunks, and a thick slice of toasted rustic bread, all for just $13. 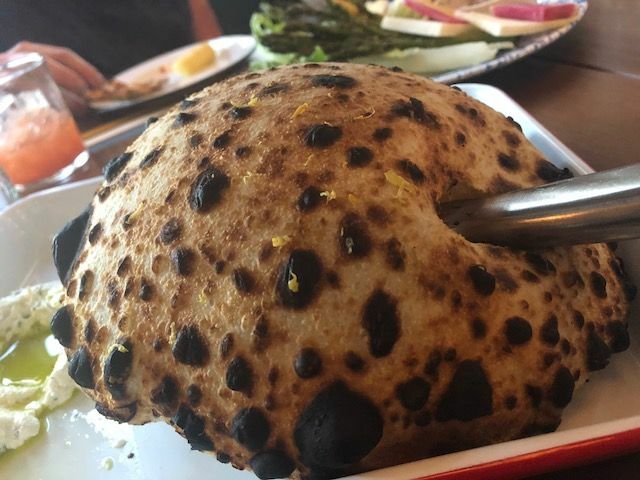 It is amazingly filling. Our favorite antipasto wrangler, Cleber, delivers a plate he is sure will please both me and my niece Dana. 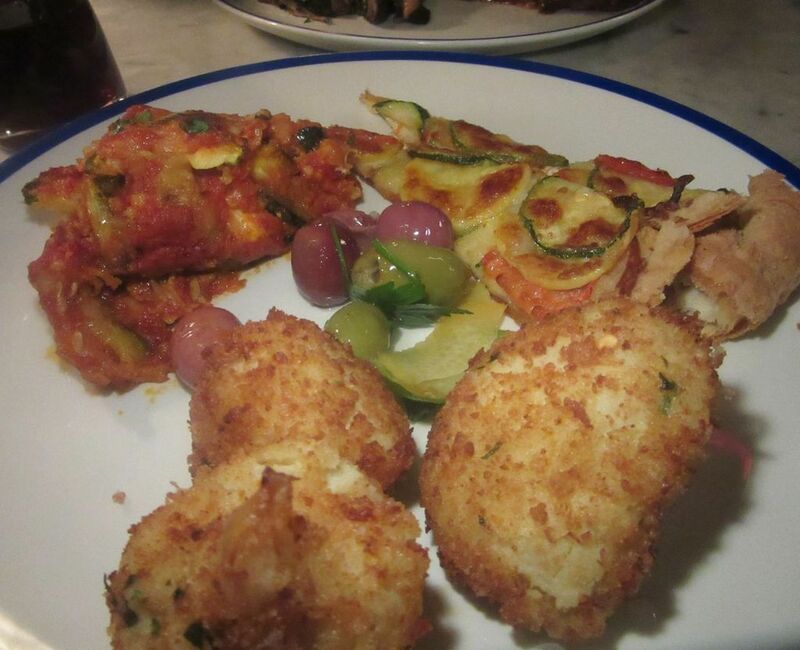 A vegetarian friend ordered this antipasto: zucchini Parmigiano, vegetable pie and fried cauliflower. 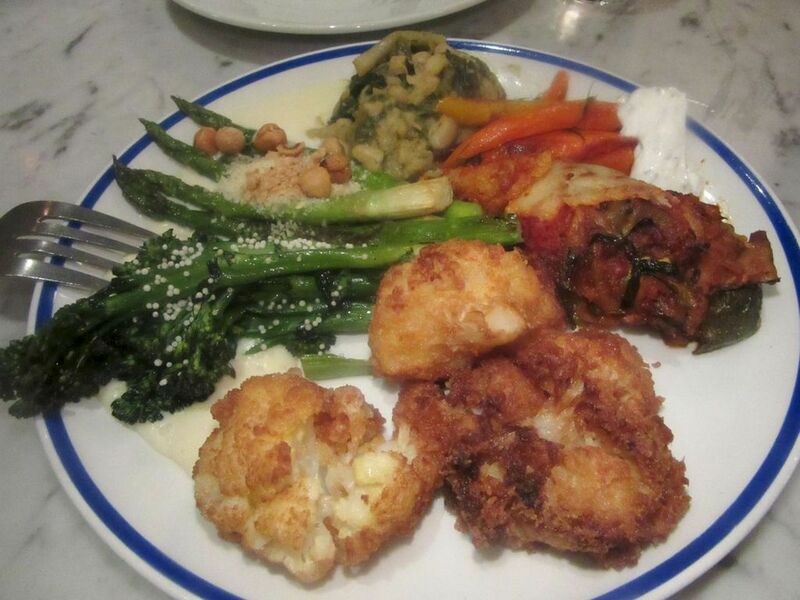 Even so, we also order a three-vegetable plate from the antipasto table. 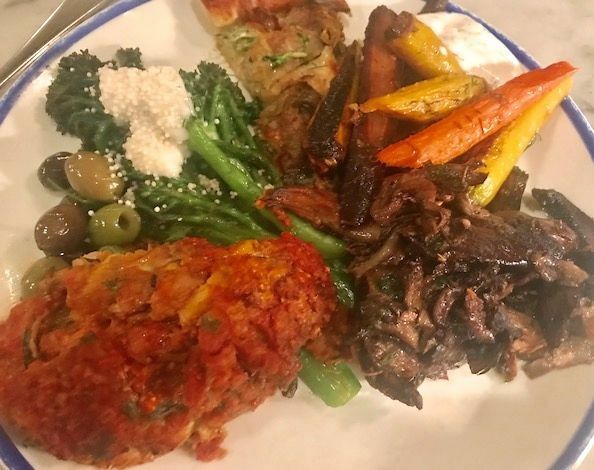 I started tipping the guy in a straw hat who waits to ladle up our choices -- eggplant caponata, zucchini parmesan, sausage and peppers, broccolini. “Do you want olives?” he may ask. Dana sat at the counter alone a few times and I think this server in the straw hat -- Cleber is his name -- fell in love with her. The three-item plates are getting more crowded. We take leftovers home. Our bill can be $60 plus tip. 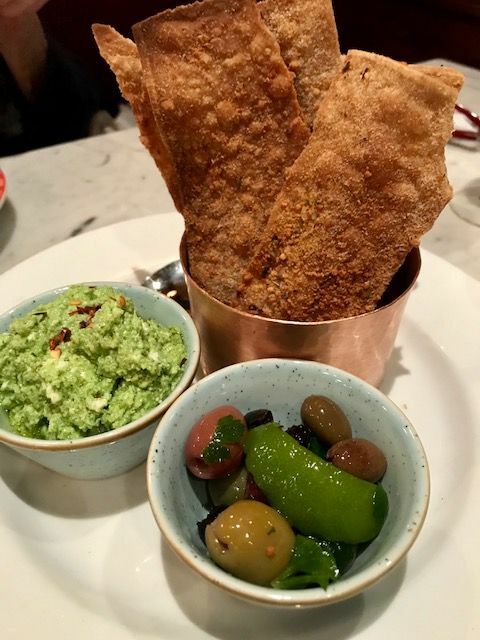 For a while you could order crisps with a spread and olives from the menu but not any more. There’s been a long-running bread reformation. At first I was annoyed. Originally the busser brought a big basket of bread: focaccia, rustic rye and lavash. Then someone apparently decided to stop the cash drain of throwing out uneaten bread. For while a designated bread man passed with a basket. That didn't work. Now the waiter deliver a few cuts of focaccia. No fanfare. 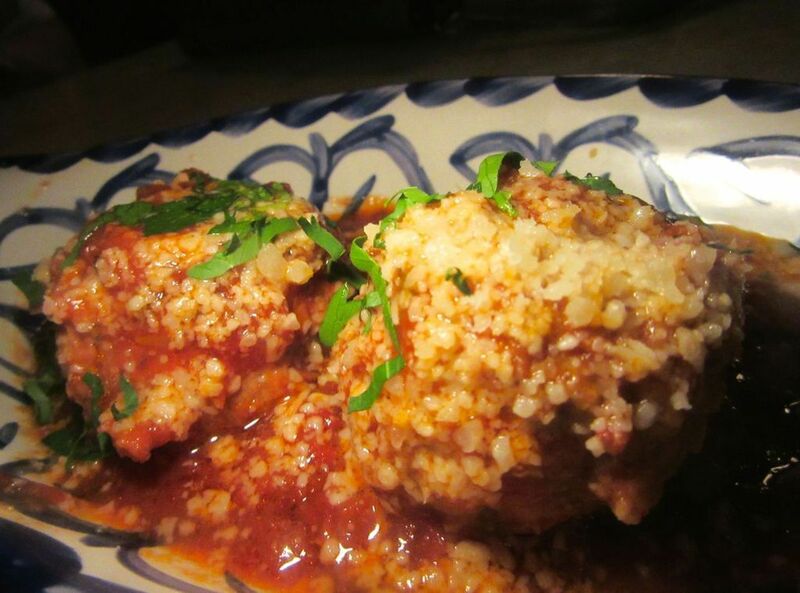 Nonna's prime rib meat balls are big and juicy. We ordered two, one for each of us. When the crew stopped serving crisps I called Shelly’s office to complain and he promised he would keep crisps in the kitchen just for me. Last week I told our waiter to bring some of my crisps from the kitchen and he looked at me like I was crazy. I guess my lavash guarantee has expired. 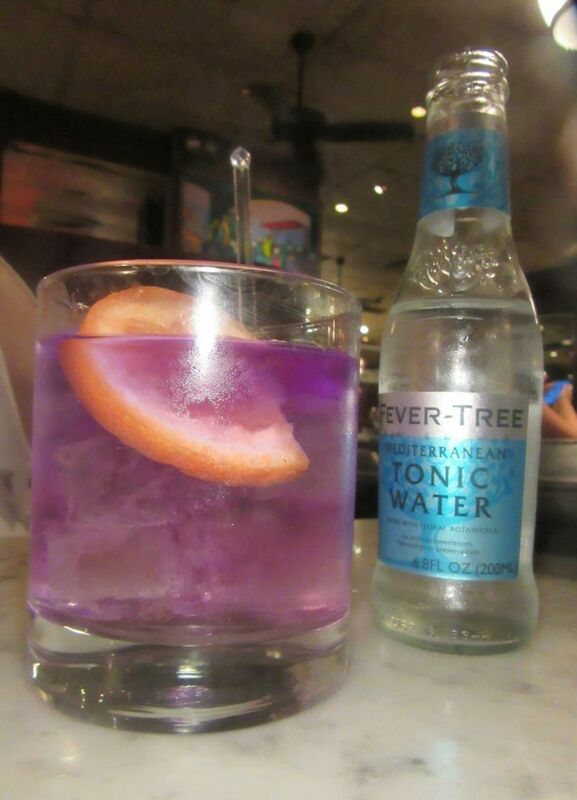 The Mean Girl cocktail is made with blue gin. 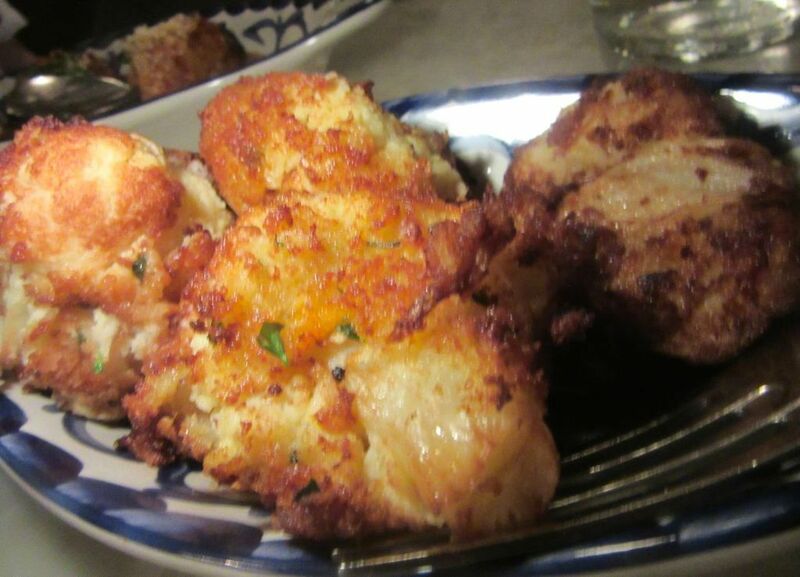 A large side of cauliflower from the antipasto table is just $10. The other day I took a friend from the East Side who had never been. She ordered a Mean Girl cocktail made with blue gin. We shared a Caesar salad, of course, with two abused-looking anchovies. 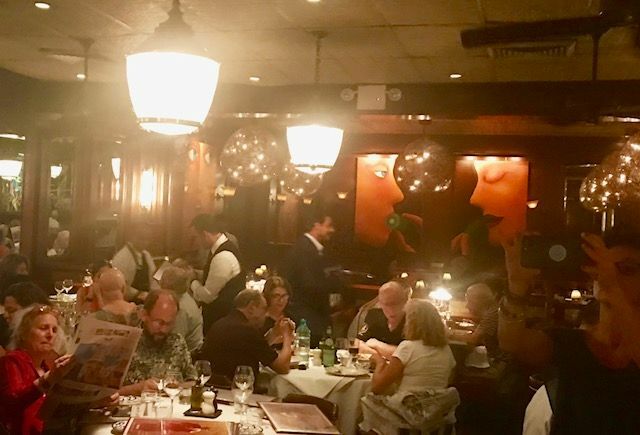 She seemed to be overwhelmed by the barrage of menu offerings, so I ordered for us: two short rib meatballs, fried artichokes alla giudea, a half dozen clams oreganata and a portion of fried cauliflower from the front display. (At my next dinner, it was a generous $10 mound of zucchini Parmesan.) Eating small plates, our bills for two usually run $80 or less. From the top: vegetable pie, carrots, mushrooms, zucchini Parmigiana, olives and broccolini. I smashed the egg on top and tossed it into this super rich spaghetti carbonara, offering it to my tablemates. When it got too hot and humid for the wedding soup, I discovered the burrata with tomatoes and toast, and the quinoa and artichoke salad. 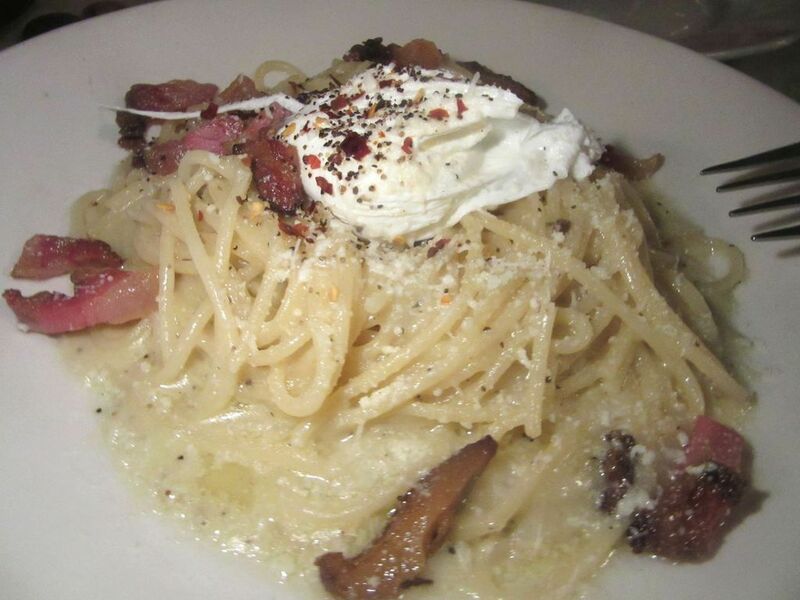 Then I fell for the super-rich spaghetti carbonara with Italian bacon and a whole poached egg to smash into it. I’ve shared the lasagna, too, and the fettuccine drowning in pesto. 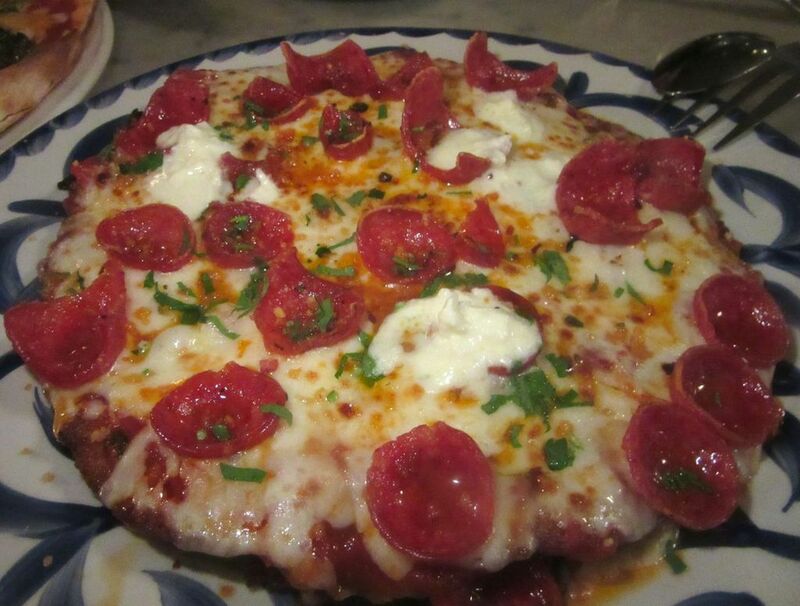 Last week I tasted the chicken pepperoni Parmigiana with guanciale and breadcrumbs. That was filling. Pepperoni thins add a kcik to the chicken Parmigiana made with pig's jaw and breadcrumbs. 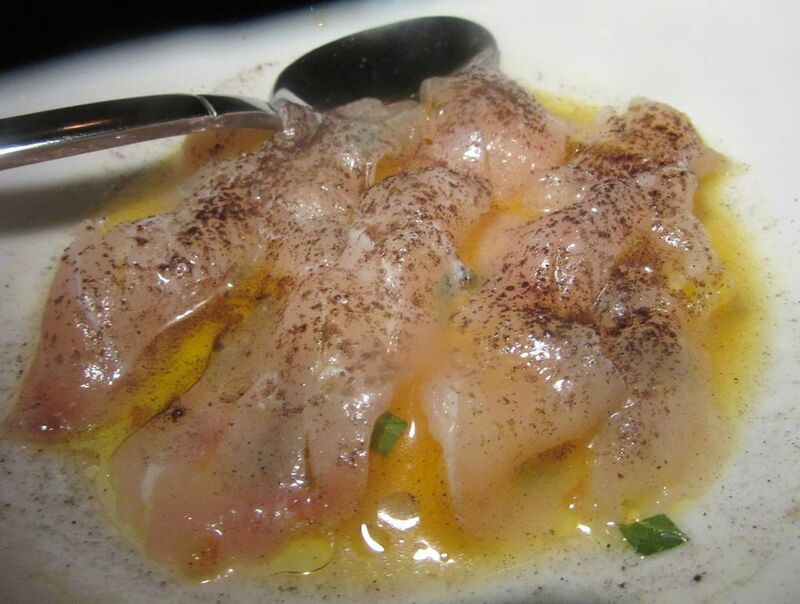 Of course, more straitlaced diners may want branzino, seared tuna with cannellini beans, filet mignon or osso bucco. Sometimes someone needs a dessert. 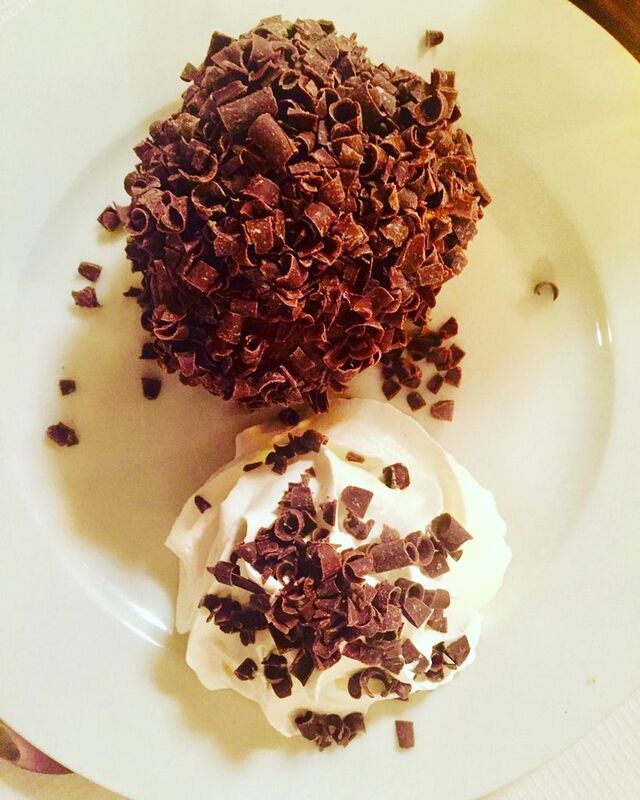 Chocolate lovers might need to have a big blob of mousse. There’s an excellent lemon pie too. Steven and I often lingered over very tart lemon sorbetto or the rich, intensely chocolate version. I usually stop at the big silver bowl near the exit for a chocolate fix. Take a napkin, the chocolate melts fast. Mostly these days I get my sweet hit as we leave, from a big silver urn of broken chocolate near the exit. It melts fast, so I’ve learned to carry it to the taxi on a napkin. But last week as I was swirling spaghetti, someone walked through the dining room with just-baked chocolate chip cookies on a baking sheet (a Fireman tradition). I took one and ate it after I signed the check. At the chocolate bowl I realized I couldn’t eat another bite. 1900 Broadway between West 63rd and 64th streets. 212 595 5331. Breakfast Monday to Friday 7:30 am to 11:30 am. Lunch Monday to Friday 11:30 am to 4 pm. Dinner Monday to Thursday 4 pm to midnight, Friday 4 pm to 12:30 am, Saturday and Sunday brunch 9 am to 3 pm, Dinner, Saturday 3 pm to 12:30 am, Sunday 3 pm to 11 pm.